Did Marvel create Daredevil as a Batman copycat? Digital collage by Slate. Images via Marvel and DC Comics. No, Daredevil was not created as a Batman copycat. The original Daredevil looked like this. 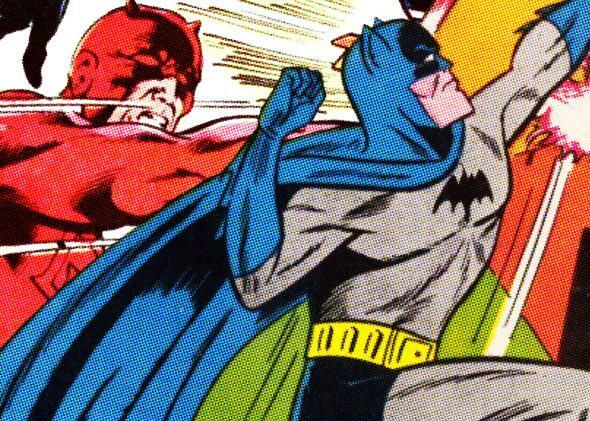 So, when first created, Daredevil was a brightly colored character, quite different from Batman. His personality was also much more typical of the Marvel superheroes of that time and wasn’t inspired by Batman at all. In the first stories, Daredevil didn’t merely operate at night. Matt Murdock (his real identity) would simply change into Daredevil whenever he wanted to go investigate something or whenever trouble arose. In those early stories, it was often daytime—more often than at night, I’d say. Batman used to operate primarily at night (although by the 1960s period when Daredevil arrived, Batman was focusing a lot more on sci-fi adventures, actually). So in this regard, too, Daredevil isn’t inspired by Batman. Matt grew up with his father in the early version of his origin story, and he was in college when his dad was eventually killed. Matt grew up in an apartment in New York City, in a working-class home. He was a bookworm who was teased at school for his intelligence and for not being into sports or fighting. After he got his superpowers through an accident involving radiation, he kept it a secret from other kids and pretended to be weak and a bookworm—very much like Peter Parker, aka Spider-Man. And also like Peter Parker, he had a father-figure die when he was older. So Daredevil’s background is all vastly more similar to Spider-Man, not Batman. In fact, the first issue of Daredevil’s comic literally has a picture of the first issue of Spider-Man on it and says that if readers liked Spider-Man, they’d also like this new Daredevil character! So when he was created, Daredevil was not inspired by Batman, either in design or personality or background or origin or abilities or stories. Now, having said that, it is true that eventually Daredevil started having a lot of similarities to Batman. Why? Because of a new young writer-artist named Frank Miller. Miller began drawing the Daredevil comics in 1979, when that particular comic was not very popular. The stories just weren’t very good, and Marvel was going to cancel the book due to lousy sales. So it decided to let Miller start writing it, since it had nothing to lose and he had some good ideas. His writing was so good, in fact, the book began to sell better and soon became one of Marvel’s best comics. Miller completely redefined Daredevil as a noirish, mature comic with cinematic layouts and artwork. He made the stories more violent and more morally complicated. Daredevil changed, operated more at night, and became a fearsome vigilante. His background also changed, with the introduction of mysticism and ninja training. The truth is that Miller was a huge Batman fan and always wanted to write for Batman, so his conception of Daredevil became an outlet for a lot of his ideas about how to do Batman. So much so, in fact, that editors sometimes had to tell him to rewrite scenes and dialogue because he was making Daredevil too much like Batman. Eventually, Miller wrote the famous Batman comic story The Dark Knight Returns, and then the equally iconic Batman: Year One. Those two comics are among the most famous and influential Batman stories ever written and are responsible for reviving the popularity of Batman in the 1980s after many years of downturn in sales and the public thinking of the character as just a campy joke. Notice, by the way, how much Miller’s background retconning for Daredevil influenced the background for Batman in the film Batman Begins. The ninja assassins group from that film is not actually based on Ra’s al Ghul’s League of Assassins in the Batman comics as much as it’s based on the ninja assassin organization called the Hand in Daredevil comics. I suspect that the reason a lot of people think Daredevil is so much like Batman that he might have been inspired by Batman is because of how Miller changed the character and how much those much later comics were indeed often inspired by ideas for Batman. But when Daredevil was first created, he was not a Batman copycat. If you want to see the Batman copycat at Marvel, it’s Moon Knight. He looks more like Batman, he acts like Batman, his alter ego is a lot like Bruce Wayne, and the stories are often written like Batman stories. It’s interesting to note that the film Batman Begins also borrowed things from Moon Knight—Batman’s gauntlets, for example, are extremely similar to Moon Knights. And when Frank Miller wrote his famous Batman story The Dark Knight Returns, which portrayed Batman as a bit mentally unhinged, with the Batman persona almost like a second personality living inside Batman’s mind, this borrowed directly from Moon Knight comics of the early and mid-1980s in which Moon Knight had multiple personalities and often seemed to be going insane. But regardless of similarities between these characters, even when they are at their most similar, the fact is Daredevil and Moon Knight and Batman all have unique qualities and lots of fantastic comic book stories. Daredevil is one of the best superhero characters and comics of all time, and the best Daredevil stories are some of the greatest comics ever written. And the new Daredevil TV show is one of the finest live-action superhero creations ever made. DC Comics: Is DC comics suffering a brain drain of its creative talent and if so why? Batman: Why doesn’t The Joker just kill Batman? Daredevil: Is Daredevil using sonar as the film suggests or is the ambiguity of the comics superior and more mysterious?